Bob Gaudio is Songwriter, keyboard player and backup vocalist. Bob Gaudio was watching “The Deer Hunter” when the idea for something that would eventually take form as the Tony-winning show “Jersey Boys” started to take shape. In one scene of the 1978 war drama starring Robert De Niro, Meryl Streep and Christopher Walken, several of the cast members drunkenly sing “Can’t Take My Eyes Off You,” a song Gaudio penned with Bob Crewe and performed by Frankie Valli in 1967. “It left such an indelible vision in my mind seeing them singing, half smashed no less, a song I had composed. It was a tremendous impact and the first beginning thought that our music has another place other than radio,” said Gaudio, 67. 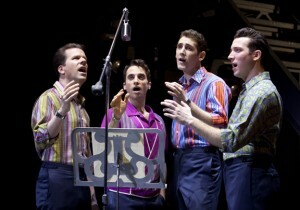 Years later, the project evolved into a musical documentary that tells the triumphant story of how Frankie Valli, Bob Gaudio, Tommy DeVito and Nick Massi became the Four Seasons, a 1960s rock ’n’ roll band that achieved international success. The group ranks among the best selling music acts of all time and was inducted into the Rock and Roll Hall of Fame in 1990. 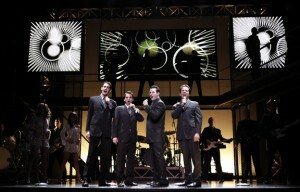 Jersey Boys national tour is currently playing at The Kentucky Center in Louisville through August 15. Buy Jersey Boys Louisville KY Tickets.